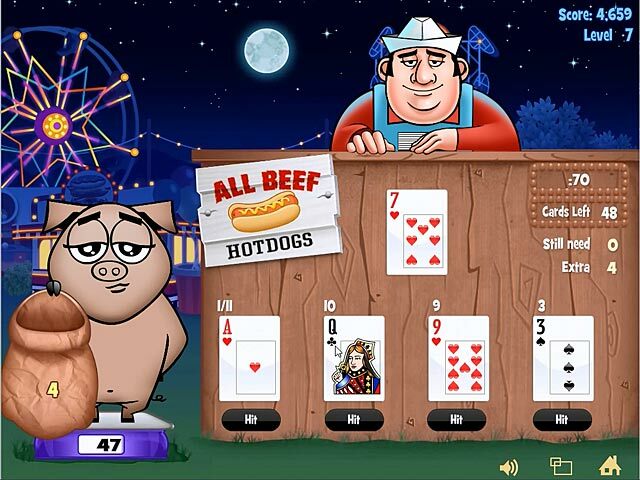 Master the game of Snackjack and help keep your prize pig fed before he decides to run away for good! 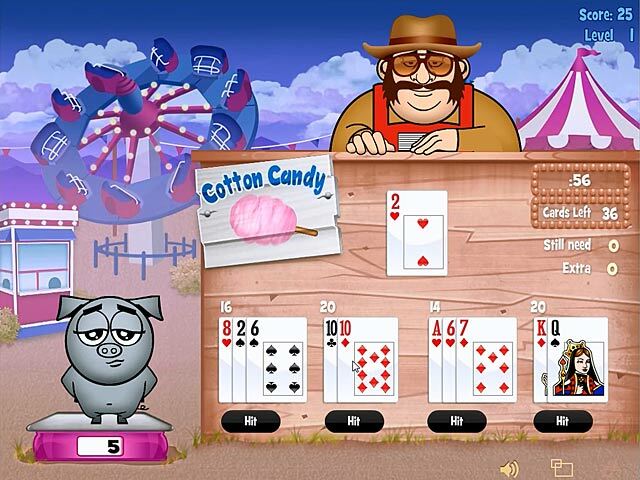 Each black jack hand will help your pig grow and win even more awards! Earn bonus points for straights and 5-card charlies as you progress through as many vendor stands as you can. Raise a champion swine, then build a home for your best pigs at Sleepy Wallow farm in Snackjack! Snackjack is rated 4.0 out of 5 by 4. Rated 4 out of 5 by stonebull7 from HMMM It IS fun!! ..and it IS fast moving. It's Blackjack and YOU hold all the player seats. Like another reviewer said...NO splits, NO double downs but still it's FUN. I like the silly animation and for a mindless, almost, cuz ya gotta add, it's a fine diversion. Perhaps, try it. I do NOT regret purchasing this game!! HIT ME!! Rated 4 out of 5 by mrm2006 from Funny Little Blackjack Game! First off, resolve yourself to the fact that you are a pig. Sorry, we are playing blackjack to feed the pig snacks. LOL You are the pig. You have 4 hands. Dealer sets out a card and you decide which of the 4 hands you want it to go to. Hit "hit" to get the card. Try not to go over 21 and bust (you lose). When time is up (you get a whole 70 seconds), you get one last card, dealer gets 2. Your 4 hands will hopefully beat out whatever the dealer has. At the end of each level, you MUST have the amount of 21s that are equal or better than the number of snacks the pig needs. (i.e., Level 1, you need 9 snacks - or 21s - to complete the level). If you have extra snacks (21s) at the end of a level - GREAT - they move onto the next level. For instance, in level 1 you need 9 snacks (or 21s), you get 13. Those extra 4 snacks move ahead to the next level (where you need 11 and, thus, you only need 7). There is no ability to NOT "hit" a card. You can't just "stay" or "split". You just keep on playing (and busting if necessary to open up a hand) until the timer counts down. This is a game of speed (you only ever get 70 seconds regardless of what level you are on or how many snacks you need to acquire, and luck (you may get 70 seconds worth of lousy cards or all great cards. So, luck/chance has a LOT to do with this game. I played the hour demo and got to, but never passed, level 9 many times - lol. It's an okay game but definitely needs work on it. There are just too many things stacked against you from the beginning. My advice ---- get as many extra snacks in the early 2 levels because those 70 seconds go by very quickly when you need upwards of 20 snacks. Happy Gaming! Rated 3 out of 5 by alsteele28 from These little pigs have had their chips! I played this many years ago on another website and I thought I would relieve the experience with a possible view to purchase, however after an hour of playing I have decided the game.is not actually for me, it is fun for a while, feeding the little piggies and building the 'farms', but it would have been nice if there had been maybe a variety of games, or you didn't have to start from the beginning every time you failed to meet the 'food quota'. No whilst it was fun to relieve the nostalgia for a while I defiantly think that for me the piggies are for the 'oven'. 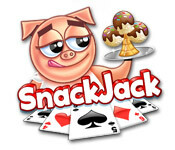 Master the game of Snackjack and help keep your prize pig fed before he decides to run away for good!